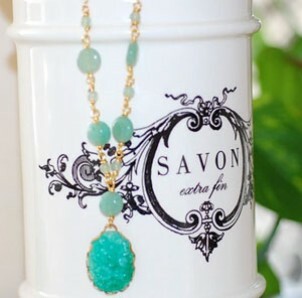 These fabulous necklaces are made by Crush Jewels. Each cameo is handmade by the designer herself! 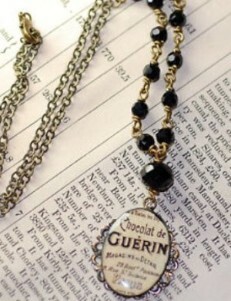 Vintage French Label Cameo is 18mm x 13mm adorned with filigree antiqued brass medallion, on an 18" antiqued brass chain and vintage faceted Onyx crystals. This necklace features a carved 1" x 3/4" vintage Japanese carved resin cabochon on a 19" brass chain with 3mm round jade beads and 10 mm jade discs.